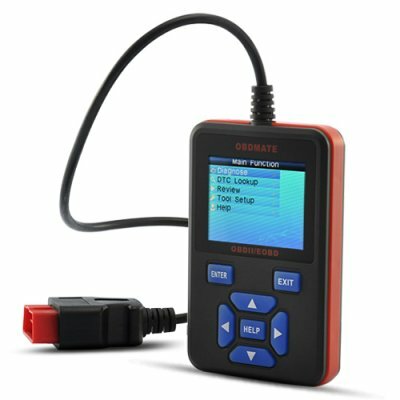 Successfully Added OBDMate Full Protocol Professional OBD-II Car Code Reader (CAN, PWM, VPW, KPW, ISO9141) to your Shopping Cart. OBD-II Car Code Reader which can read CAN, PWM, VPW, KPW and ISO9141 protocols. Easily and instantly detect problems with your car before they turn into huge repair bills! Even the most complicated problem will seem easy with this Professional OBD-II Car Code Reader since it will tell you exactly what's going on with your vehicle. Not to mention, this special Full Protocol version is designed to work on all OBDII compliant vehicles (including the CAN, J1850 PWM, J1850 VPW, ISO9141 and KWP2000 protocols), so you can be sure it works with yours! The OBD-II code scanner reads information from your car and is powered directly with no need for batteries. Navigate through the friendly user interface using the 7 rubber buttons and the LCD display will let you know immediately what problems your vehicle has. With this Professional OBD-II Car Code Reader, you can also easily determine the cause of the “Check Engine Light (MIL)”, display live O2 sensor test data, on-board monitor test results and display current trip information (distance, fuel used, average speed, etc. ), retrieve vehicle information (VIN, CIN and CVN), read hard(memory)/pending(intermittent) and historic codes and show definitions, and much more! This OBD-II Car Code Reader comes with a large screen, thin design, and easy to navigate menu. Available in our warehouse now, order today and we'll ship it to you tomorrow. Brought to you by Chinavasion, the leader in wholesale electronics and car accessories.